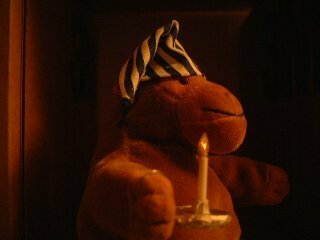 "I'm a very tired monkey, indeed..."
Mr Monkey dons his nightcap before climbing the stairs to bed. And, of course, when he gets up in the morning to check that the garden is still there. 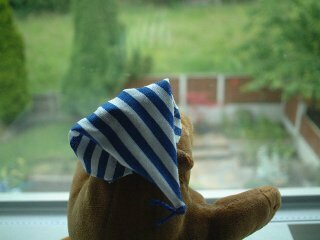 Mr Monkey's nightcap is made from from material intended to be turned into a nightshirt and nightcap for a teddy bear. His candle is cardboard, silver paper, and some plastic tubes.